On my first trip to Japan in 2013, I completely fell in love with the country — but I couldn’t have named a favorite city. I deemed Japan far greater than the sum of its parts. That may still be true — but this time, I have a favorite. Tokyo, I love you so much. I’m about to say something a bit taboo in the travel blogging community: you can have fun in Japan on a backpacking budget, but it’s so much better with more financial wiggle room. You don’t have to live lavishly — the only expensive thing I did was the Park Hyatt Tokyo, and that was only the last two nights. Most of what I did was a mid-range trip, taking into mind that Tokyo is an expensive city with prices similar to New York, London, and Paris. 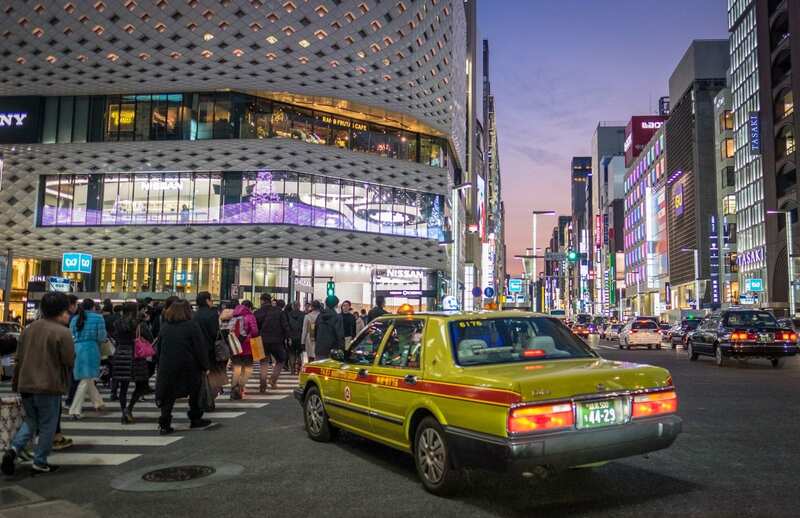 Mid-range travel in Tokyo means you need to take the subway most of the time, but you can afford an occasional cab ride when you arrive late and are too tired to walk 25 minutes to your accommodation. 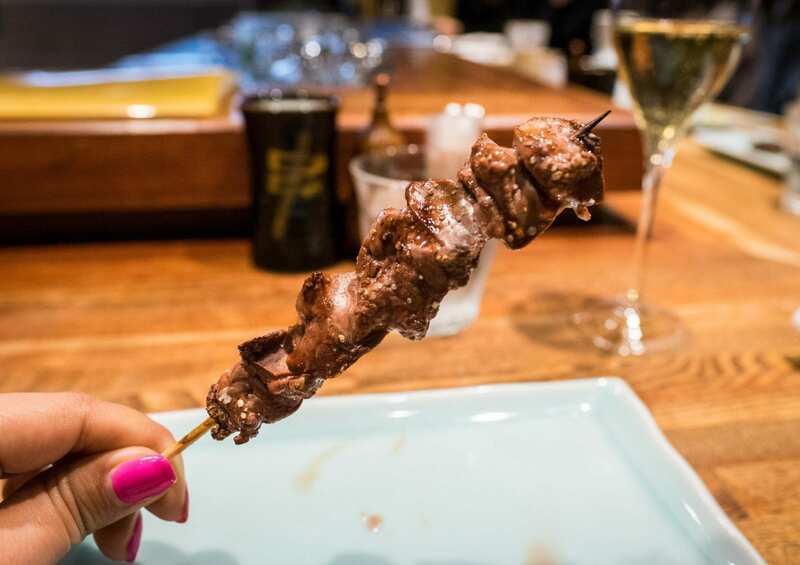 It means you might not be able to get a $300 kaiseki meal, but you can definitely afford $60 Michelin-starred yakitori. It means you can pay for a fun food tour instead of trying to figure out incomprehensible Japanese food stands on your own. It means you can splurge on cute Japanese baby stuff for your expectant friends. This was the second part of my campaign with ANA — All Nippon Airways to promote Japan’s only five-star airline. For the first part of the trip, I visited the northern island of Hokkaido. While ANA covered only my first three days in Tokyo, I’m including all the experiences I enjoyed in my final two days in Tokyo as well. It takes a bit of an adjustment period to get used to Japan, even if you’ve been before. Japan is just so different from every other place in the world. When arriving in Sapporo, I was struck by how long it took me to find an ATM, buy a ticket for the train, figure out which way was out of the train station — even if I knew to make a beeline to the nearest convenience store for some onigiri before passing out in my hotel at 9:30 PM. Tokyo is different, though. 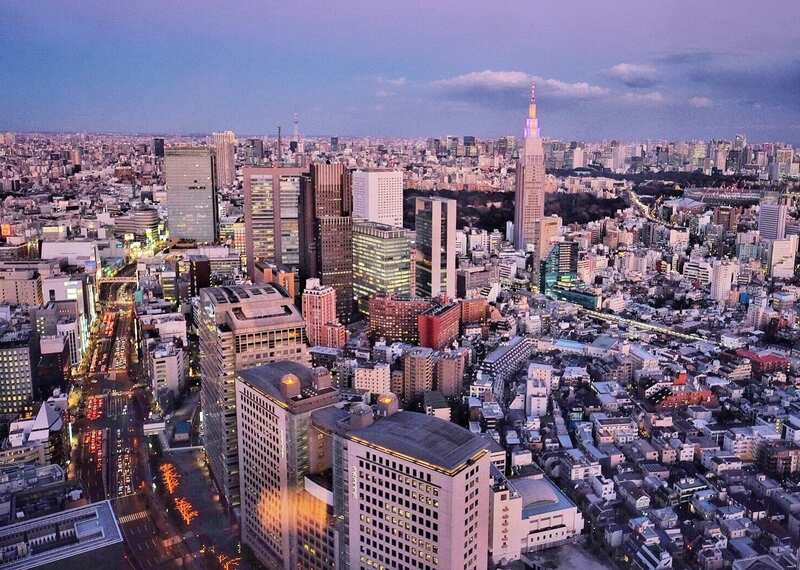 Japan may have its own language and culture and way of doing things, but so do big cities. It’s hard to tell whether Tokyo is more of a Japanese place or more of a big city. I’m a girl who loves her megacities. I live in New York and some of my favorite cities around the world include the giant metropolises of Paris, Bangkok, Berlin, and Hong Kong. Big cities prioritize speed and anonymity. People give each other space on an individual basis, and in groups, they swoop past each other like schools of fish. The language of a megacity is a language understood throughout the world, and in some ways, Madrid and Seoul are less foreign to me than small town America. This time was all about getting swept up in the megacity that is Tokyo. Here are the activities I enjoyed the most. I think one reason why I loved Tokyo so much this time is because I found my favorite neighborhood — Ginza. Ginza is my zone. It’s famous for being the upscale shopping neighborhood of Tokyo. I was surprised how quickly Ginza became the center of my trip — I couldn’t stop returning! On Airbnb I found a personal shopping tour in Ginza — you join a professional stylist and he takes you to cool shops, showing you interesting Japanese brands. It ended up being just me and a girl named Nisha from Canada, and our stylist-guide Hiro took us on a fashion journey through the coolest spots! We ogled Japanese sportswear in the Ginza Six complex, admired Comme des Garçons duds at another mall (I was afraid to breathe on them), and Hiro took us to some more moderately priced department stores. 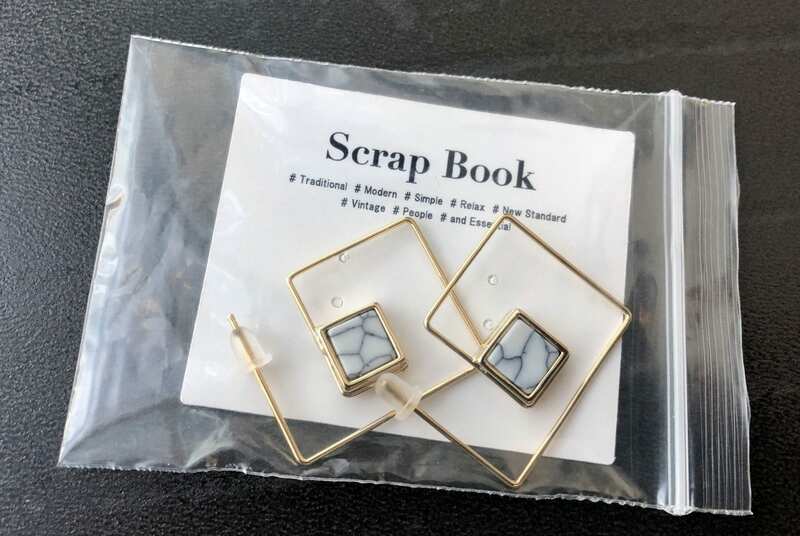 I spotted these earrings and had to buy them. Aren’t they cute? Ginza is a fantastic place to explore and I especially loved the department stores. 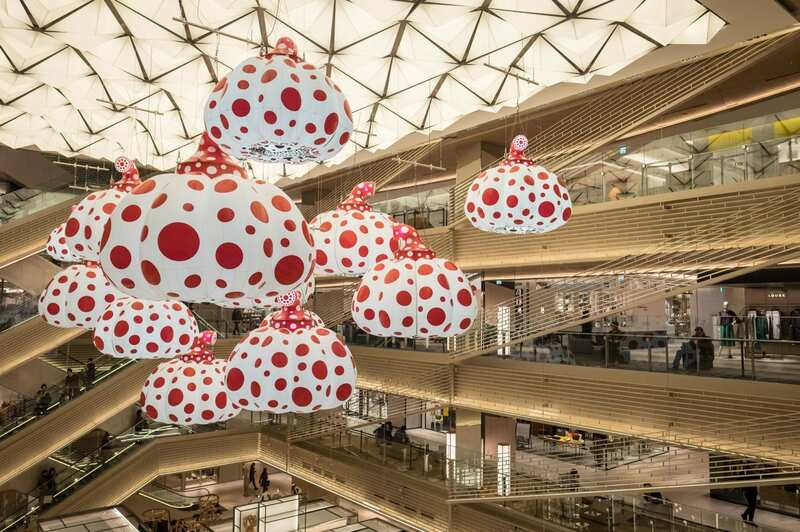 If you go, Tokyu Plaza was my favorite department store for stuff I would actually buy (mid-ranged goods and cute only-in-Japan brands), while Mitsukoshi was my favorite department store for gawking at expensive stuff, as well as its fancy food hall in the basement. Ginza Six is mostly home to expensive brands but it has a cool interior and is well worth a stop as well. My favorite store of all was Itoya — a world-famous stationery store. Like many stores in Ginza, it’s tall and skinny with many floors — and in this case, it’s 12 floors of beautiful handmade paper goods! 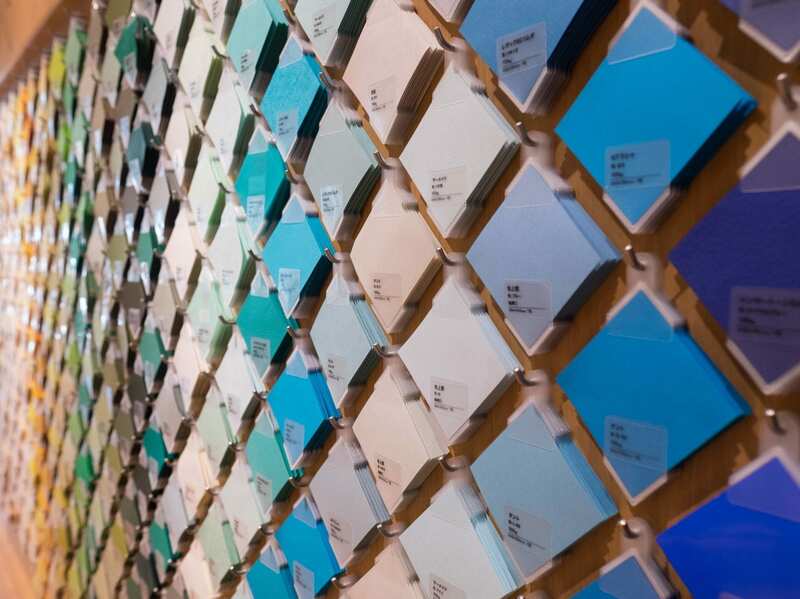 I felt blissed out just looking at the different colors of washi paper. Keep in mind that if you spend more than 5,000 yen ($50) at any one store in Japan, you’re entitled to a tax refund. 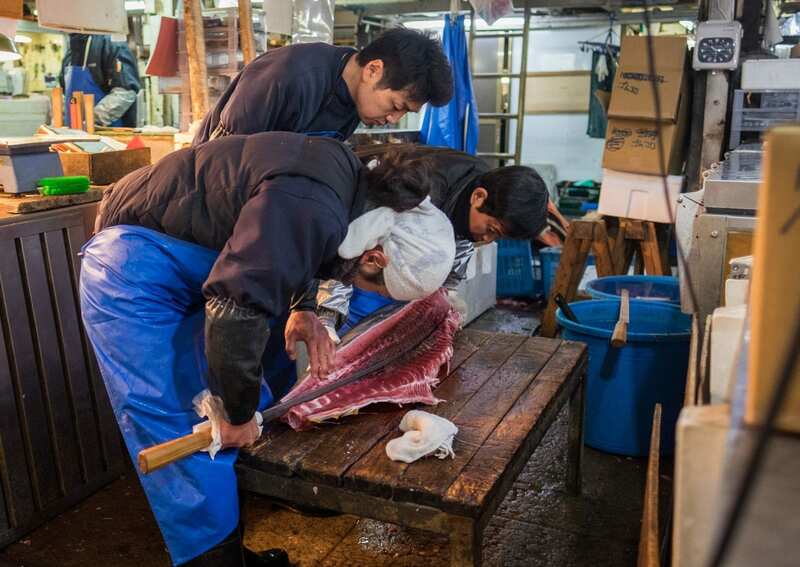 Tsukiji Fish Market is arguably one of the most touristy activities in Japan — but only for now, as the market is planning to move locations in October 2018. I Googled around and booked a tour of the market with Ninja Food Tours. 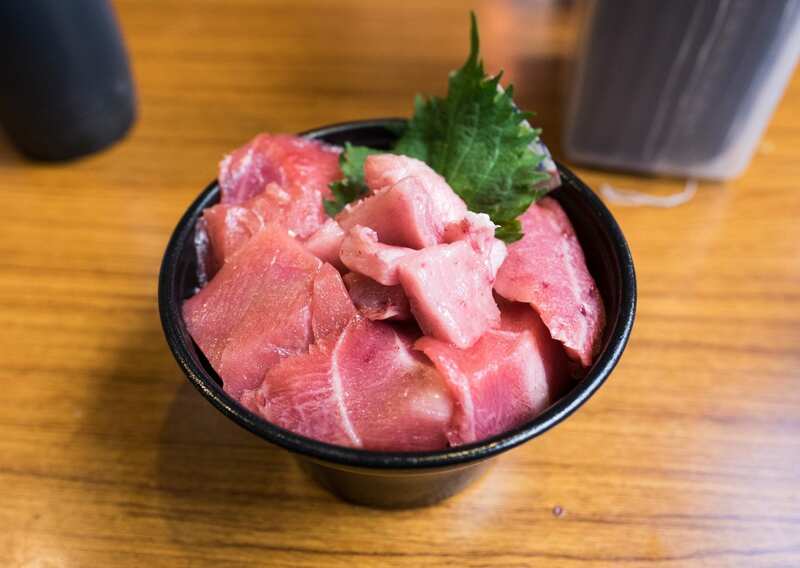 Tsukiji Fish Market was not what I expected — I thought it would be a more public market, the kind of place where fresh fish are on display and old ladies haggle the vendors down for every last yen. It wasn’t like that at all. Most of the market was where vendors do their work and sell wholesale. Regular consumers do their shopping outside the main market. As a result, I was relieved I had a tour guide for this place — I would have had no idea where to go without him. We did our eating on the outside of the market, starting with the intriguingly named “parent and child” dish. 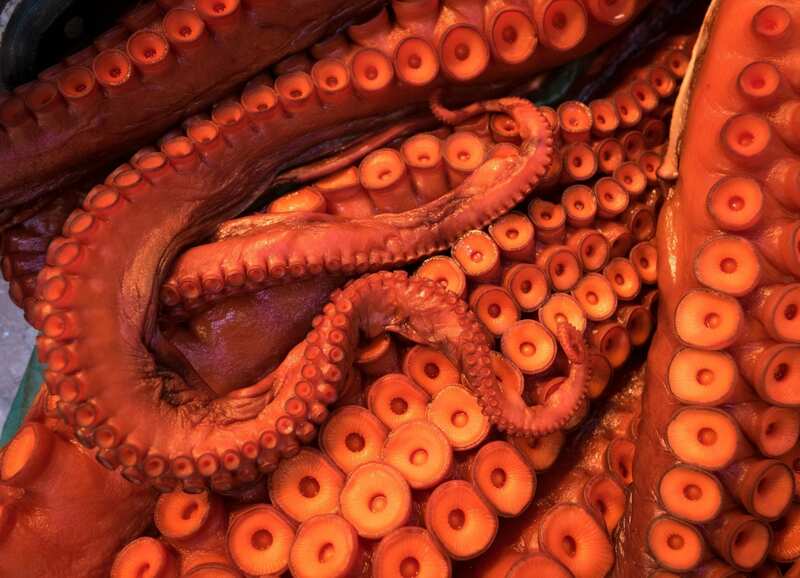 Did you know that lots of fishmongers don’t like to eat seafood? It makes sense; if you’re surrounded by fish all day, it’s probably not that appetizing. 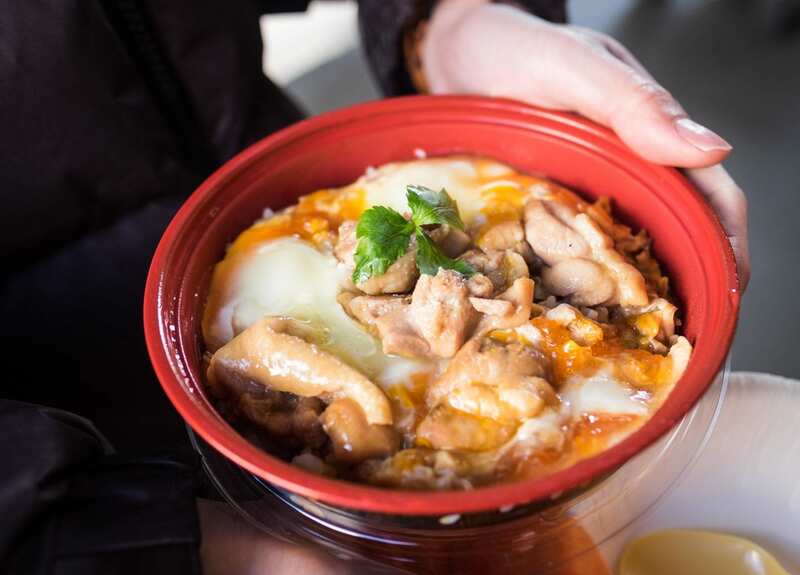 Yuma introduced us to oyakodon, a savory chicken and egg stew over rice. Oyakodon means “parent and child,” reminding me of I will bathe you in your children memes. My first thought was, “Wow, those eggs are runny.” Then I took a bite and learned just how delicious those runny eggs were! This dish was fantastic, a gorgeous blend of flavors, far better than it looked, and I can understand why it’s a beloved Japanese comfort food. Winter is the beginning of strawberry season, and there were so many on offer. 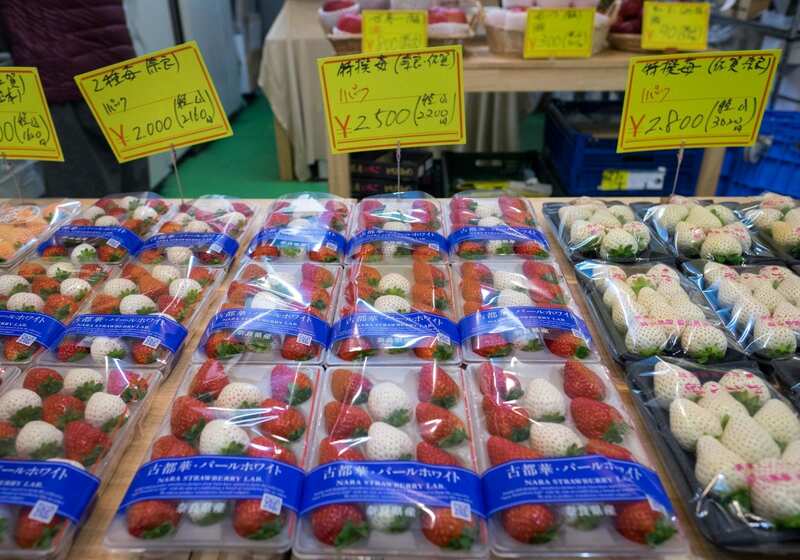 In Japanese style, most strawberries were immaculate — an even shade of bright red shaped into a perfect point. But WHITE strawberries were on display as well! We tried some and they don’t have much flavor, but they’re pleasing to the eye. The Japanese like to give them as gifts. Of course we had to have some fresh tuna! This mini tuna bowl was so good, I could have eaten another one immediately. I’ve never had one so good in my life. The Japanese way is to start with the leaner, redder fish around the edge then move on to the lighter, fattier pieces. My favorite item of all? Custard-flavored mochi with strawberry. OH, these are the best dessert IN THE WORLD. I’ve been hit-or-miss with the popular Japanese rice-based sweet before, but custard-flavored mochi is the best blend of eastern and western flavors. Guys, I got so addicted to these, I was eating one every day! I even found a seller in Kyoto Station who laughed whenever I showed up at her cart for my next hit. I so enjoyed this food tour! Yuma is a great guide and lived in the US for awhile, so we had a lot to talk about. He even kindly emailed me food recommendations for Kyoto. If you do go to Tsukiji Fish Market, with or without a guide, please keep in mind that this is a working market, not a theme park. 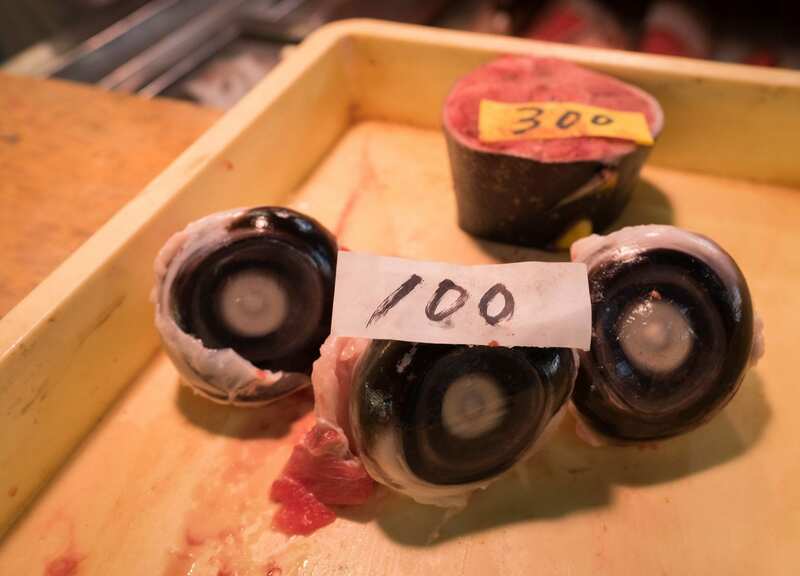 Be thoughtful in your photography, especially of the fishmongers; don’t treat the market like a human zoo. Keep a respectful distance. Jump out of anyone’s way. You are a guest here and people are just trying to get their work done. Golden Gai was one of the highlights of my first trip to Tokyo — it’s a neighborhood filled with tiny hovel bars, many of them themed, stacked on top of each other. Some are members-only; if there’s English signage, you can assume non-members are welcome. Many of these bars have cover charges. This time, contrary to last time, a cover charge wasn’t a deal-breaker. I stepped into a tiny six-seat bar stacked with vinyl records where two thirty-something locals were already deep into their cocktails. The bartender and locals welcomed me with smiles. And I stayed. 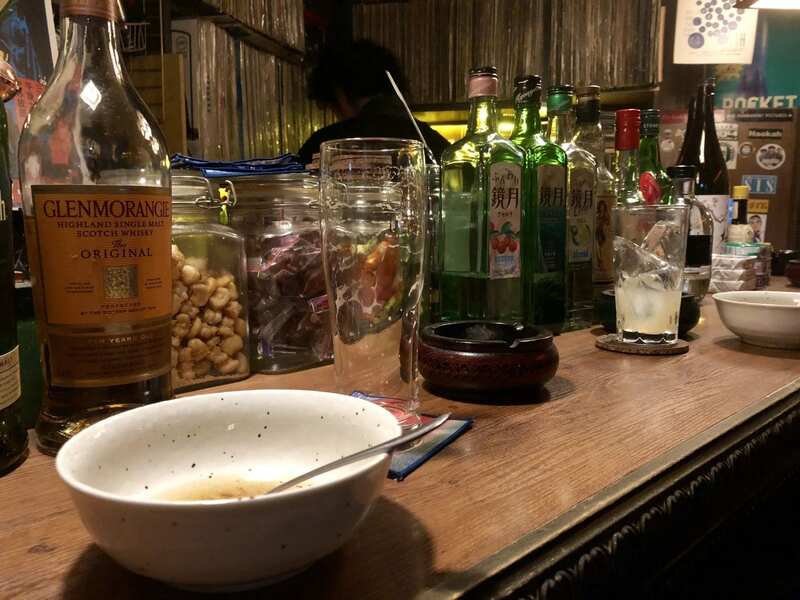 Rather than hopping around the cheapest bars in the neighborhood, I found one moderately priced bar and stayed there for a few beers, enjoying the music, chatting with my new companions. The bartender and customers mostly chatted amongst themselves but would occasionally translate and bring me into the conversation, which I appreciated! 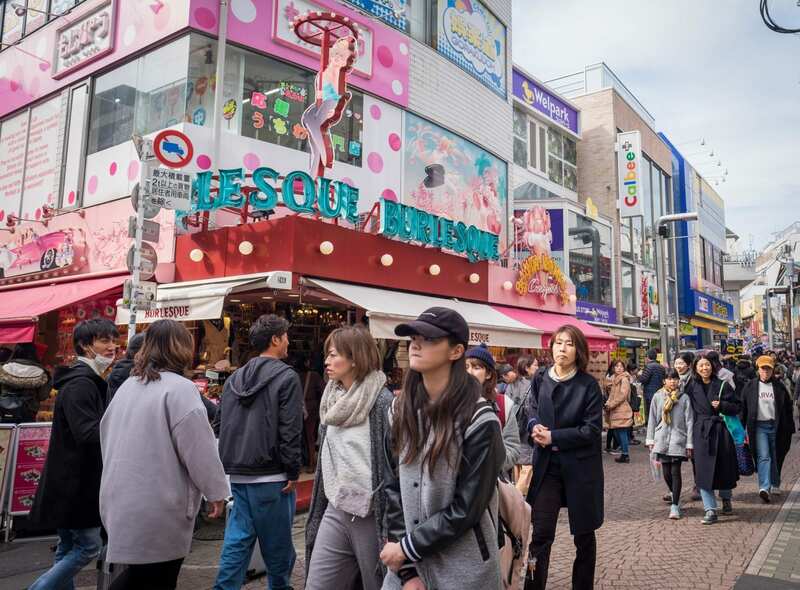 Harajuku might be the most famous neighborhood in Tokyo — it’s the center of “kawaii” (cute) culture. This is where you’re likeliest to find outlandish Tokyo fashion and costumed locals, especially on Saturdays. And Instagram has gotten HUGE since my last visit in 2013, so there are lots of places catering to photo seekers with cool backdrops and unusual foods. I’ll be honest — this time around, Harajuku was a bit much for my taste. 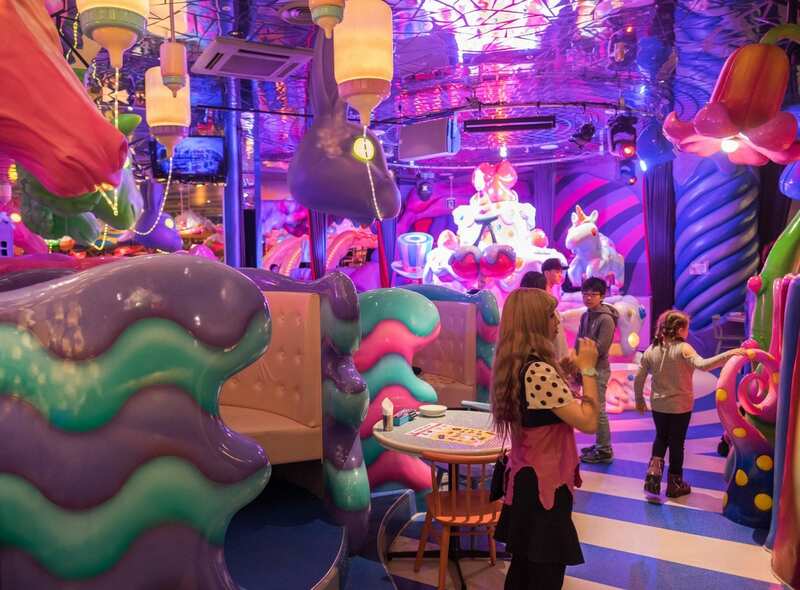 Takeshita Street assaulted my senses and the Kawaii Monster Cafe, though so very Japanese, is not something I’d recommend unless you have kids and/or are into kawaii culture. 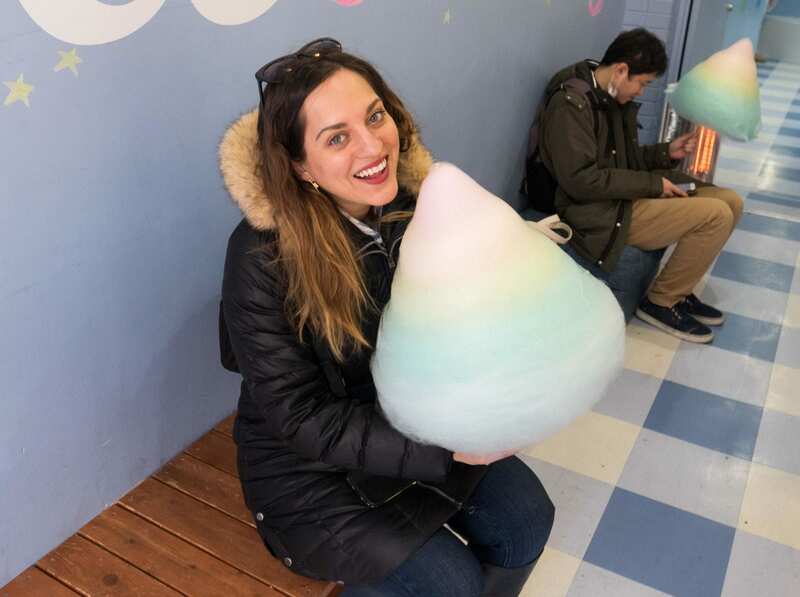 I did, however, get a giant cotton candy! Instagrammable as hell and surprisingly delicious. Each flavor tastes different — I loved the sour blue cotton candy. Yep, I ate the whole thing. 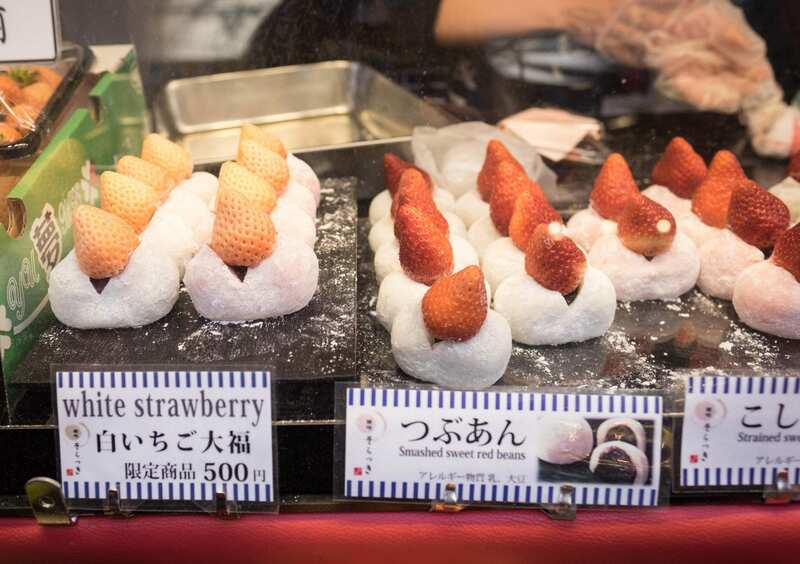 You’ll find vendors selling it on Takeshita Street. 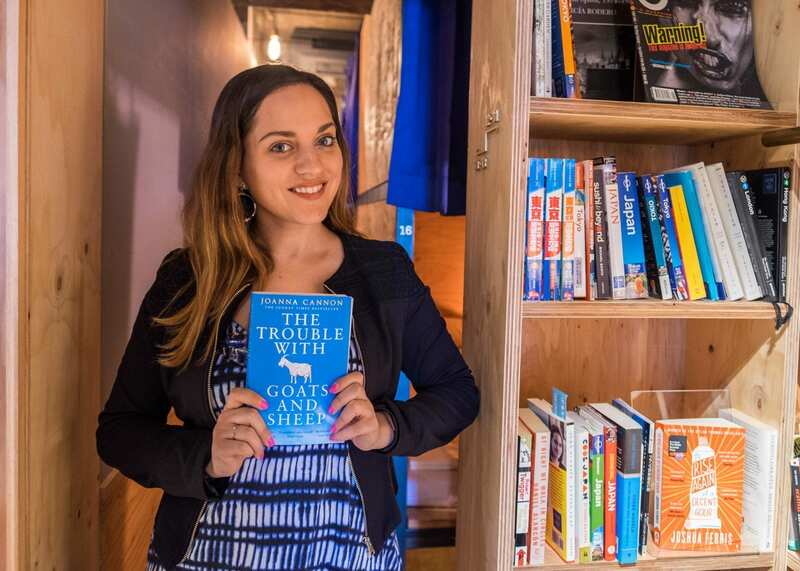 My friends Jessica and Hai from Notes of Nomads have been living in Tokyo for years and knowing how much I love to read, they suggested we check out Tokyo’s Book and Bed. 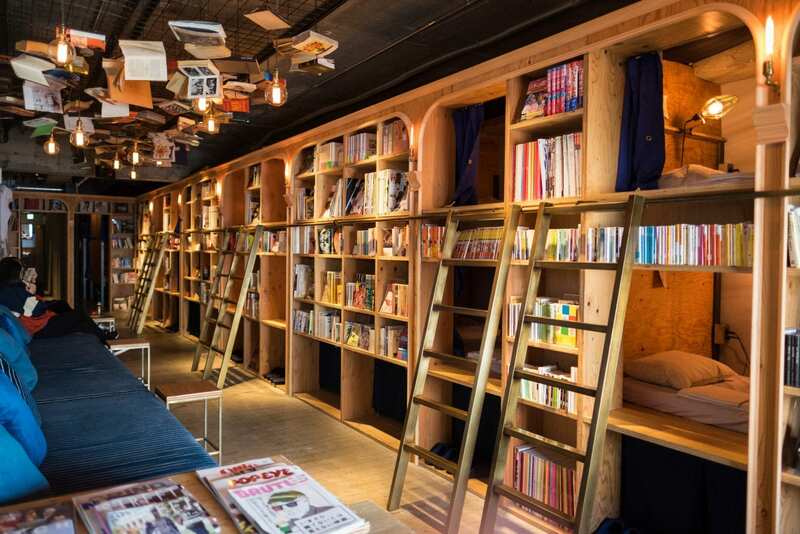 This capsule hotel in the Ikebukuro neighborhood is covered with bookshelves and literary chandeliers. Have you ever dreamed of sleeping overnight in a library? I HAVE. This was a super fun place to do a photo shoot! I swore off hostel dorms for good when I was 30. I just can’t deal with the noise, smells, and inconsiderate roommates who sleep through their alarms. But a capsule hotel like this? With semi-private rooms? In the polite society that is Japan? I’ll give it a hard maybe. On the way back, I fulfilled a long-held travel dream by staying at the Park Hyatt Tokyo, the Lost in Translation hotel. I partnered with the hotel for this stay — in exchange for coverage, they offered me one comped night and additional remaining nights at a discounted media rate that totaled around $500 with taxes, plus free spa access and breakfast — so I decided to book two nights. $500 for a single night is way beyond my usual price range (even if it was more like $250 per night with the comped night), but for this hotel, it was absolutely worth it. Honestly, this is the only place I ever want to stay in Tokyo. It was like living in a dream, where every service was brought to me as soon as I thought of it. My room on the 48th floor had an incredible view over Tokyo, especially during a purple sunset. The concierge called all over Ginza to find places where I could bring sealed custard mochi home. The pool was a peaceful place for a morning plunge, and the spa had a Japanese onsen, of course. And that bar? Oh, that bar. It was exactly like the movie, down to the jazz band and the incredible floor-to-ceiling views over Tokyo. The bar’s full name is the New York Bar and my friend Annette and I indulged in several New York-themed cocktails. My favorite was the Radio City, made with Grey Goose Earl Grey, pink pepper syrup, and soda. Bird Land has several tasting menus available. I opted for the smallest tasting menu because I didn’t feel that hungry, but I do feel like I missed out on some interesting dishes. One by one, the skewers were brought out. Chicken with green onions and sea salt — the best chicken ever. Chicken livers. Cabbage with butter and truffle oil. Mushrooms. Spiced ground chicken in egg yolk sauce. Before dessert was served, the waiter offered me a chance to try anything else, and at his recommendation, I ordered some chicken skin. Crispy and delicious! Note: don’t just type “Bird Land” into Google Maps — they only show one location, in Marounuchi, not the Ginza place where I had booked my reservation. They were very understanding and let me stay. Tokyo has now earned a place among my favorite cities in the world! Even though I just got back, I would so love to return to Tokyo and just hang out. I feel like I have a bit of ownership of the city now. In retrospect, I wish I hadn’t planned a return to Kyoto and Osaka on this trip — I felt like my second visit to those cities was a letdown. But spending a full week in Tokyo wouldn’t have been a waste of time; even after a jam-packed month, you’ve only scraped Tokyo’s surface. I ended my trip with a lovely surprise — it may have taken 14 hours to fly from JFK to Narita with ANA, but on the way back, the flight was two hours shorter and departing from the much closer Haneda Airport, which saved me about three hours. In short, I went door to door, from the Park Hyatt Tokyo to my apartment in Harlem, including an hourlong shuttle from the hotel to Haneda and an hourlong Uber from JFK to my apartment, in less than 17 hours. If you can fly into Haneda Airport instead of Narita, do it. It saves you so much time! READ MORE: What’s It Like to Travel in Japan? Essential Info: In Tokyo I stayed at two different hotels: first the Hotel & Spa J-Mex Tokyo in Shinjuku, which turned out to be a love hotel (!). Of course I accidentally booked myself into a love hotel!! That said, the staff were lovely and gave me privacy, my suite was massive and comfortable, and it was just a short walk from Golden Gai. Rates from $176. Next up was the Park Hyatt Tokyo, which was fantastic start to finish, a true luxury experience, with some of the most spectacular views in town. I loved my suite, the pool, the spa area, and the incredible service. Rates from $616. Hiro’s Ginza Personal Shopping Experience costs $72 on Airbnb. Tell him the kind of things you’d like to shop for before your visit and he’ll pick out some special spots for you. 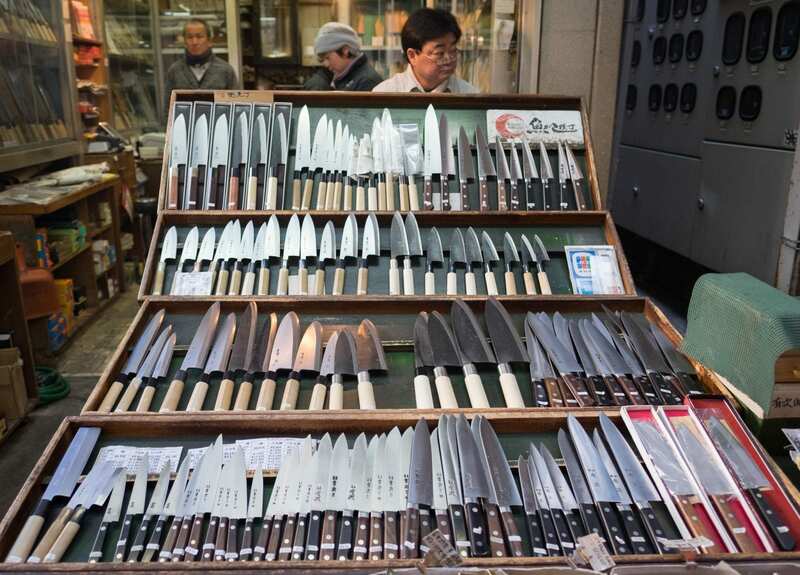 Ninja Food Tours operates a variety of food tours in Tokyo, Kyoto and Osaka. 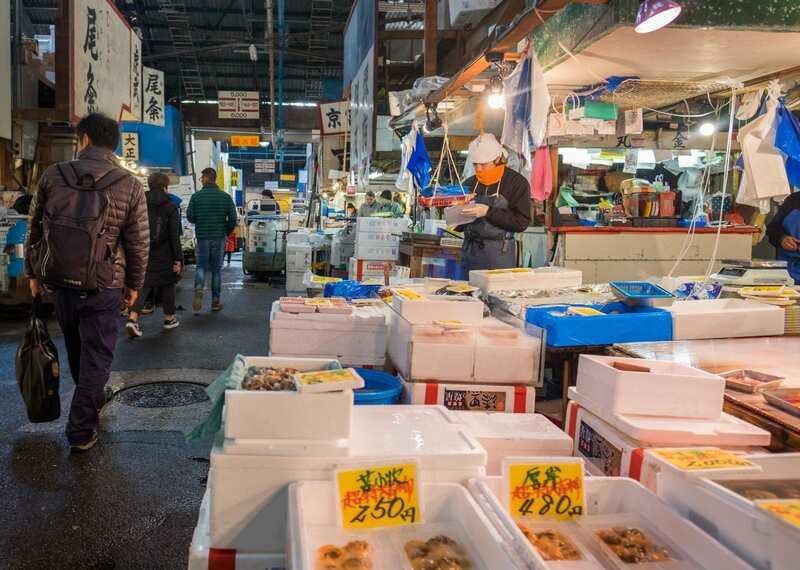 I loved my Tsukiji Market Tour and it costs 8,500 yen + 8% tax ($86 total). There are discounts for booking multiple tours. The Tokyo Book and Bed has several locations; we visited the one in Ikebukuro. Overnight rates start at 3,800 yen ($36) for compact beds and 4,800 yen ($45) for standard beds; you can also visit during the day like we did for 500 yen ($5) per person per hour. Bird Land‘s tasting menus start at 6,300 yen ($59), and you can always order dishes a la carte. This campaign was brought to you by ANA — All Nippon Airways, who covered the expenses of three days in Tokyo as well as all my time in Hokkaido. I extended my time in Japan an additional five days at my own expense. I had full freedom to do anything I wanted, and all vendors were all paid in full except the Park Hyatt Tokyo, who offered me one comped night and one night at a media rate of $500 including spa access and breakfast, plus they kindly picked up my and Annette’s bar tab. All opinions, as always, are my own. Have you been to Tokyo? How did you like it? The post Splurging on the Right Things in Tokyo appeared first on Adventurous Kate.